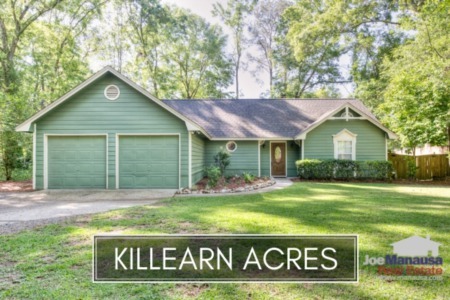 Killearn Acres is a popular neighborhood on the Northeast side of Tallahassee which continually ranks among the most active communities in our area. 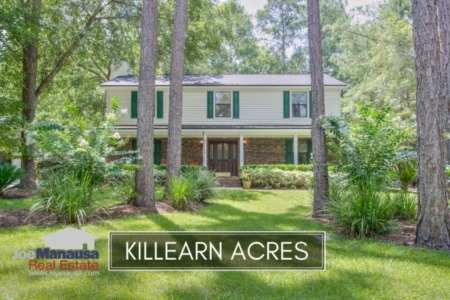 With more than 1,400 three and four bedroom homes, Killearn Acres attracts buyers who want to be close to restaurants, shopping, churches and some of the higher ranking schools in Leon County. Additionally, as it is situated along the northern border of Killearn Estates, Killearn Acres also is exposed to the traffic that its large neighbor draws. Considering that more than half of all home sales recorded in Tallahassee fall in the NE quadrant, you can expect Killearn Acres to only get busier as the real estate market recovery gains momentum. So take a look at the current situation in Killearn Acres, including average home prices, home values, and home sizes, as well as all current listings in the Tallahassee MLS and closed home sales going back to 1991. For the real estate graphs found in this report, you will find the number of closed home sales for each year (red columns, measured on the left vertical axis), and an important real estate statistic shown in blue (measured on the right vertical axis. It is important to note that the narrative contained below is for sales through December for all previous years, but through the fourth week of September in 2015. The graphs and the closed sales table will be continuously updated into the future (meaning bookmark this page if you always want to know the current status of homes in Killearn Acres). Average home prices are up more than 14% thus far in 2015, fully recovering the decline posted in 2014. Home prices are currently 18% below the peak of the market prices established in 2007. Low prices and low mortgage interest rates continue to make Killearn Acres one of the top-10 selling neighborhoods in Tallahassee. The average recorded sales price is $173,000 for Killearn Acres thus far in 2015. Home sales activity is very active, and closings through this writing already surprise each entire year going back to 2009. It is very likely that this will be the best year for home sales in Killearn Acres since 2006, though the pace of sales is still far lower than what was posted during the 1990s. Thus far in 2015, there have been 62 closed home sales in Killearn Acres. Average home values in Killearn Acres have been fairly stable since 2012, but I suspect it is time that we start to see values rise above a four year plateau. There will be fewer short sales and foreclosures moving forward, thus fewer distressed homes to hold down home values. Through the fourth week of September, the average value of a home sold in Killearn Acres has been $104 per square foot. This is up 11% over the bottom reached in 2011, but still down about 22% from the market high set back in 2007. This means that hundreds of homeowners who have purchased or refinanced their homes within the past ten years still owe more on their homes than they could repay with a sale. The average home size sold in Killearn Acres typically falls in a range of 1,500 to 1,600 square feet, but this year buyers have been selecting the larger homes. In fact, the 62 sales thus far in 2015 have averaged a whopping 1,628 square feet, the highest average size ever recorded in a year. I hope you enjoyed our September 2015 update on home sales in Killearn Acres, please feel free to drop me a note if you have questions not covered in this report.